Parametric tests provide inferences for making statements about the means of parent populations, At test is commonly used for this purpose. This test is based on the Student’s statistic, The t statistic assumes that the variable is normally distributed and the mean is known (or assumed to be known), and the population variance is estimated from the sample. Assume that the random variable X is normally distributed, with mean p. and unknown population variance (F2, which is estimated by the sample variance s2. Recall that the standard deviation of the sample mean, X, is estimated as sx = s/√n. Then t = (X – µ.) is t distributed with n – 1 degrees of freedom. The t distribution is similar to the normal distribution in appearance, Both distributions are bell shaped and symmetric, However as compared to the normal distribution, the t distribution has more area in the tails and less in the center, This is because population variance (F2 is unknown and is estimated by the sample variance s2. Given the uncertainty in the value of s2, the observed values of t are more variable than those of z, Thus, we must go a larger number of standard deviations from 0 to encompass a certain percentage of values from the t distribution than is the case with the normal distribution. Yet, as the number of degrees of freedom increases, the t distribution approaches the normal distribution. In fact, for large samples of 120 or more, the distribution and the normal distribution are virtually indistinguishable. Table 4 in the Statistical’Appendix shows selected percentiles of the I distribution. Although normality is assumed, the 1 test is quite robust to departures from normality. 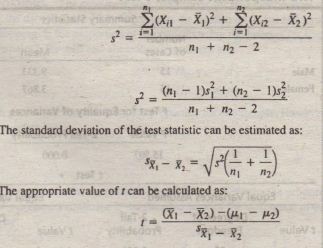 The procedure for hypothesis testing, for the special case when the statistic is used, is as follows. 1. 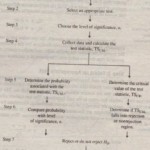 Formulate the null (Ho and the alternative (H¹) hypotheses. 2. Select the appropriate formula for the t statistic. 3. Select a significance level, a, for testing Ho’ Typically, the 0.05 level is selected.’? 4. 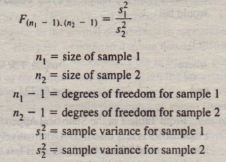 Take one or two samples and compute the mean and standard deviation for each sample. 5. Calculate the t statistic assuming Ho is true. 8. Express the conclusion reached by the I test in terms of the marketing research problem. Several hypotheses in marketing relate to parameters from two different populations: for example, the users and nonusers of a brand differ in terms of their perceptions of the brand, the high-income consumers spend more on entertainment than low-income consumers, or the proportion of brand-loyal users in segment 1 is more than the proportion in segment II. Samples drawn randomly from different populations are termed independent samples. As in the case for one sample. the hypotheses could relate to means or proportions. MEANS In the case of means for two independent samples, the hypotheses take the following form. The degrees of freedom in this case are (n1 + n2 – 2). If the two populations have unequal variances. an exact t cannot be computed for the difference in sample means. Instead, an approximation to is computed. 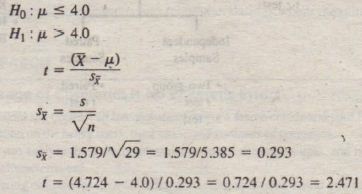 The number of degrees freedom in this case is usually not an integer, but a reasonably accurate probability can be obtained by rounding to the-nearest integer. As can be seen, the critical value of the F distribution- depends upon two sets of degrees of freedom-those in the numerator and those in the denominator. The critical values of F for various degrees of freedom for the numerator and denominator are given in Table 5 of the Statistical Appendix. 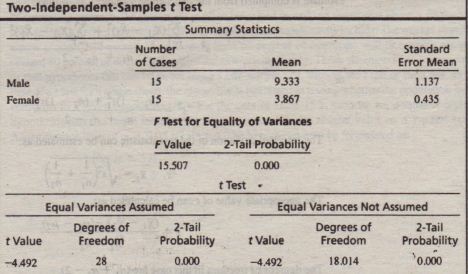 If the probability of F is greater than the significance level a, Ho is not rejected, and t based on the pooled variance estimate can be used. On the other hand, if the probability of F is less than or equal to a, Ho is rejected and t based on a separate variance estimate is used. conduct the test both ways. Instead of the small sample of 30, if this were a large and representative sample, there are profound implications for Internet service providers such as AOL, Earth Link, and the various telephone (e.g., Verizon) and cable (e.g., Comcast) companies. In order to target the heavy Internet users, these companies should focus on males. Thus, more advertising dollars should be spent on magazines that cater to male audiences than those that target females. Given a two-tail test. the area to the right of the critical value is a/2 or 0.025. Hence. the critical value of the test statistic is 1.96. Because the calculated value is less than the critical value. the null hypothesis cannot be rejected. Thus. the proportion of users (0.733) for males and (0.400) for females is not significantly different for the two samples, Note that although the difference is substantial. it is not statistically significant due to the small sample sizes (15 in each group).